The scoop behind Provo’s scooter renaissance. 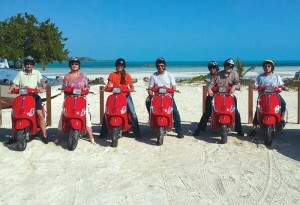 When I first moved to Providenciales 20 years ago, many folks used scooters to get from Point A to Point B. There was little traffic, fewer people and places, and life was a lot more laid back. However, as the roads deteriorated and the pace stepped up, scooter travel seemed to fade away. Today, I notice a renaissance of these distinctive, open-air vehicles, largely the result of one of the island’s newest transportation companies, Paradise Scooters and Auto. It is no longer uncommon to see a single or group of scooter-riders skimming along the now-paved roadways. It makes sense again, both economically and environmentally, as well as being the ideal way to truly experience this “Beautiful by Nature” country. With a warm, sunny climate a given and most of the Islands’ roadways smooth and paved, scooter travel is fun again. Riders can feel the breeze in their hair, sun on their face and smell the salty tang of the sea, as well as experience the full effect of the turquoise sea and lush tropical bush, occasionally punctuated with the bright bloom of flowers. 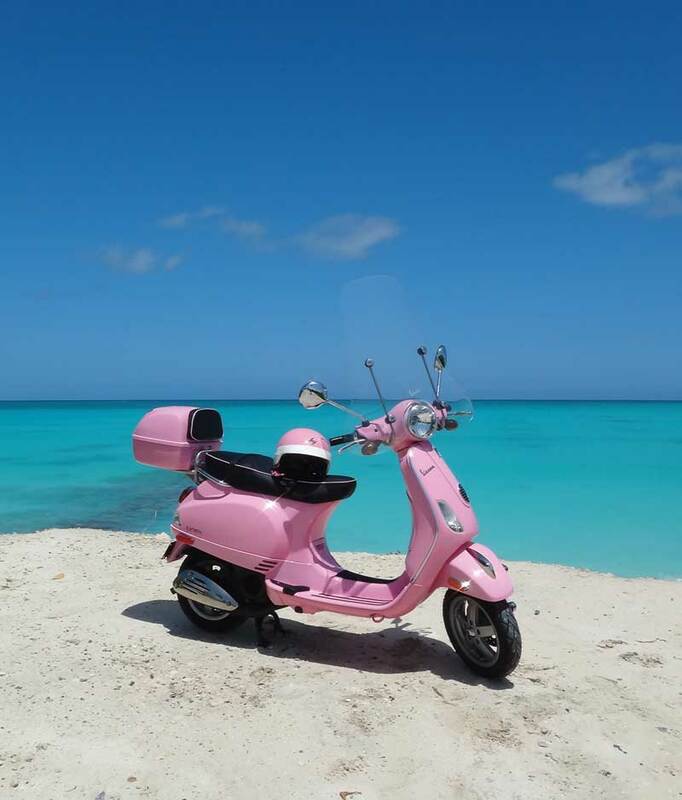 This eye-catching “Breast Cancer Awareness” themed scooter is one of the Paradise Scooters and Auto fleet that promises to revolutionize Provo’s roadways. Their plan was to bring a reputable scooter dealership to TCI that would offer an alternate, affordable, energy efficient and fun mode of transportation not only for visitors, but to the people who live and work in TCI. Staunch believers in the need for “green” solutions to the planet’s woes, the decision was made and Paradise Scooters became a reality. Rosa Gargano was more than thrilled to be part of the family endeavor. From her first visit to St. Thomas as a teenager, she thought the tropics were heaven on earth. Now, her “Caribbean dream” has come true! In December 2012, her family, along with local business partners, opened Paradise Scooters and Auto in Grace Bay Plaza, across from Regent Village in Grace Bay. Paradise Scooters sells and rents both Vespa scooters, the “Mercedes” of the scooter world, and their custom-manufactured Paradise model, (call it the “Toyota”), no less dependable, but with a lower price tag. The shiny vehicles are sturdy, well-built and safe, available in either 150 or 125 cc for good acceleration and speed and all their scooters can accommodate two riders. As gas prices on-island approach $7.00/gallon, the fact that scooters can get from 100 to 155 miles/gallon is an attractive selling point! Rosa, who rides her scooter everywhere, says, “I spend about $12/month for gas and less than $300/year on insurance. I fill my tank so infrequently that I often forget about it for weeks.” Wow! Besides being low emission and environmentally friendly, purchasing a scooter is easy on the wallet, with prices less than $1,900. for the most-popular Paradise model. My questions, however, focused on safety. Isn’t a scooter hard to ride . . . and what about other drivers? Rosa said she had the same trepidation the first time she hopped aboard, “but after a few hours I was comfortable and hooked. Now I find any excuse I can to leave the office to go for a scooter ride.” Besides emphasizing caution and awareness, Paradise Scooters’ staff provides free lessons to all customers, whether sales or rental, and will not let anyone leave the property until they feel comfortable. Rosa explains that other vehicles—even the notorious jitneys—give her a wide berth, so she feels especially safe on the road, even at night. To encourage residents to enjoy the fun and economical scooter lifestyle, Paradise Scooters is starting a scooter club this spring. Anyone can join, with the idea of riding together to explore the island on occasional weekends. With a dozen scooters already sold each month, the group is likely to be large and growing. Paradise Scooters’ popular and value-priced six-hour Vespa tour explores Provo’s nooks and crannies and includes an island-style lunch. Interest in renting scooters by tourists is also high. Paradise Scooters offers a popular six-hour Vespa tour, including an island-style lunch, for the low price of $99. Guided by locals, the tour explores Provo’s fascinating nooks and crannies, including the Conch Farm, beaches, historical landmarks and local settlements of Chalk Sound, Blue Hills, Five Cays, Leeward and Long Bay. Future plans for the company include importing inexpensive (less than $10,000.) and fuel-efficient cars that boast up to 55 miles/gallon, and similarly “green” SUVs, jeeps, beach buggies and vans. (Paradise also sells and rents bicycles and hybrid electric bikes—the Electric Stride and Storm—which you can pedal or throttle, with power on demand.) With a mechanic on staff, they promise full service and support for these ground-breaking vehicles. For more information, visit www.paradisescooters.tc or call 649 333 3333. Ms. Borsuk: I really enjoyed reading your article in the Times. Retro (Mopeds) and green surely go together on T&C. WOW! Reasonable tours and lunch included! The Gargano family have really invested in a worthwhile venture for the island. Wish them the best of luck. DRSONE P.S. Any chance I can get a date with Rosa? For a tour, naturally. I want a date with Rosa too! What a great company and tour on the island! LOVE PARADISE SCOOTERS! !